Rian Johnson has created an amazing film in the Star Wars saga with The Last Jedi. While certainly not the best in the series, it is certainly not the worst. One can only wait and see if J.J. Abrams can wrap up all the unanswered questions in the final film in this trilogy in 2019. Ever since Star Wars: The Force Awakens came out in 2015, audiences have been on pins and needles waiting for the next installment in the Star Wars saga and, aside from a few minor issues, fans will not be disappointed. While the plot has mainly been shrouded in secrecy (and this review will try to continue with that so as to let you, the moviegoer, have the best experience possible watching this film) Star Wars: The Last Jedi picks basically up right where Star Wars: The Force Awakens left off. The rebel alliance has struck a huge blow to The First Order with the destruction of Star Killer base, but with great cost such as the death of Han Solo, Finn (John Boyega; Pacific Rim Uprising) left in a coma, and Rey (Daisy Ridley; Murder on The Orient Express) and Chewbacca (the sole waking survivors of their Star Killer Base adventure) are left on their own to seek out Luke Skywalker (Mark Hamill; Kingsman: The Secret Service). The majority of the cast from Star Wars: The Force Awakens is back for the latest go around in the Star Wars saga including Adam Driver (Kylo Ren), Carrie Fisher (Princess Leia), Daisy Ridley (Rey), John Boyega (Finn), Oscar Isaac (Poe Dameron), Domhnall Gleeson (General Hux). Other characters from the previous installment also make minor appearances throughout the film. In addition to these characters, a few new ones are introduced that certainly help move the film along and give some amazing performances — Laura Dern (Jurassic Park), Benicio Del Toro (Guardians of The Galaxy), and Kelly Marie Tran (XOXO). Directing, as well as writing the new film, is Rian Johnson (Looper), and while he gives his own vision and take on a galaxy far far away he still keeps true to all things that make a great Star Wars film including amazing space battles (some of the best ever filmed), out of this world aliens (including Porgs aka "new Ewoks"), and eastern philosophy about a living force. All of this is wrapped up in a serial style film that is ultimately the fight between good and evil. The brain trust behind the new saga (Kathleen Kennedy, J.J. Abrams) appears to be pushing away the original cast members (including the droids) to make way for the new ones so they can appeal to a younger generation. While this decision makes sense from a long-term financial standpoint, it is also a shame as the older generations that grew up with the original trilogy who have their hopes up that the characters they loved would finally get their spotlight again will certainly be disappointed. Unlike with some of the recent Marvel films that Disney also produces, the comedy, in Star Wars: The Last Jedi works. The only issue with it was there was an overabundance of it. I suspect they were possibly trying to make up for the lack of humor in Rogue One: A Star Wars Story that was a truly serious film. However, they went a bit too overboard. While every humorous line hit the mark for comedic gold, this was not supposed to be a comedy film. People who had issues with the recycled plot of Star Wars: The Force Awakens will most likely have the same complaints to a degree with this film as it pays homage to Star Wars: The Empire Strikes Back and Star Wars: Return of The Jedi. However, just like last time, this will most likely be a very small but very vocal minority. Rest assured just like Star Wars: The Force Awakens this film stands on its own merits. Saying all this, however, does not take away from the fact that Rian Johnson has created an amazing film in the Star Wars saga. While certainly not the best in the series (nothing will probably ever take that mantle away from Star Wars: The Empire Strikes Back), it is certainly not the worst. One can only wait and see if J.J. Abrams can wrap up all the unanswered questions in the final film in this trilogy in 2019. Until then, us fans will be waiting with baited breath. 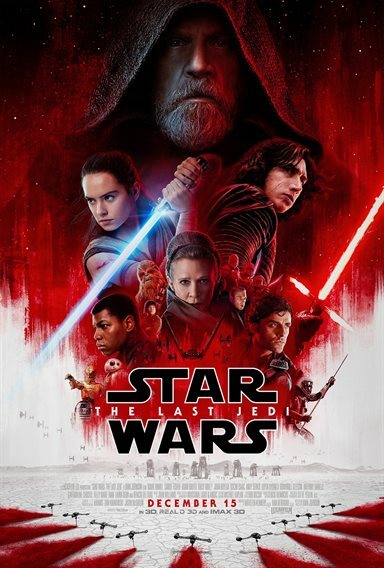 Download Star Wars: The Last Jedi from the iTunes Store in Digial HD. For more information about Star Wars: The Last Jedi visit the FlickDirect Movie Database.